Welcome back to another episode of our homebrew podcast! 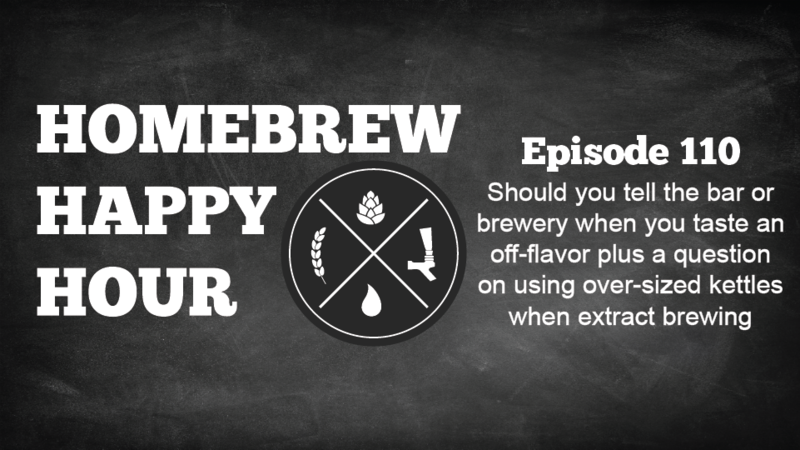 On today’s episode we take our first voicemail call from a listener who experienced off-flavors while recently visiting an out-of-town bar and he was wondering what OUR approach would be when informing the bar or brewery about an off-flavor. We also discuss a question from a listener who bought a 15 gallon kettle even though they’re still doing 5 gallon extract batches and he’s curious if he should use a smaller kettle or what options he has so he doesn’t have to shelve his awesome new 15 gallon Spike kettle for the time being. As always, If you have a question that you’d like us to discuss on a future episode, please click on the “Submit a Question” link at the top of our website or you can now call in your questions via our questions hotline @ 325-305-6107 and leave your message after the beep. Today’s show is brought to you by HomebrewSupply.com! HBS’ has all of your favorite recipe kits, fresh ingredients, and homebrew equipment in stock. Homebrew Happy Hour listeners can visit HomebrewSupply.com and use the promo code “HHH” to receive 5% off your order.